Our Real Hickory Three Drawer Log Armoire is hand-crafted using hickory. Bark-on hickory logs are used for the handles and trim and really give your bedroom an earthy rustic vibe. 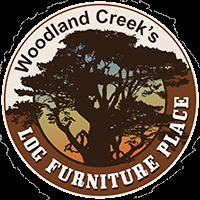 Real wood construction ensures that you receive an heirloom piece of furniture to enjoy for years to come. If you love the rustic nature of this piece, swing over and check out the rest of our Real Hickory Bedroom Collection. Choice of wardrobe hanging bar, adjustable shelf, or two adjustable shelves.